19 Feb 2011 - Tottenham Court Road, London. UkUncut have recently been grabbing headlines with their novel take on the recent Tory Government "Essential Cuts to Public Spending". Instead of eyeing up our welfare state and deciding which bits to trim or slash completely in the name of efficiency, UkUncut have been looking at the tax avoiding Tory friendly big businesses and pressuring them to pay their fair share. Do we really need to to close all our Libraries when Vodafone are being let off paying their £6Bn tax bill? 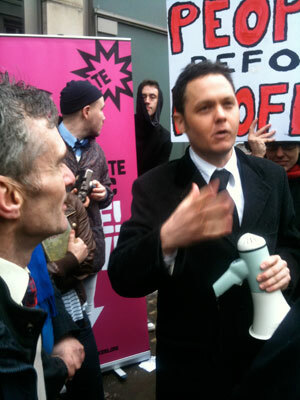 Should student grants be cut when Barclays are paying 1% of the tax they are supposed to? Should our NHS be privatised when we're still bailing out the banks to the tune of billions of pounds a year? 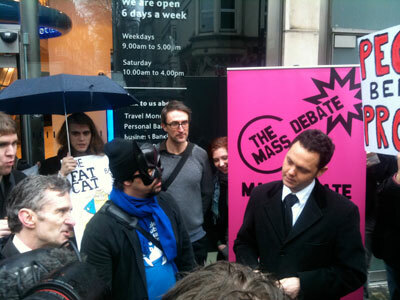 For their latest action, the Hijackers decided to join in and bring along our latest tactic "The Mass Debate". The plan was simple, everyone would meet up at Soho Sq in the morning, then dash off in different groups to various branches of Barclays in order to turn them into Libraries, Schools and more. 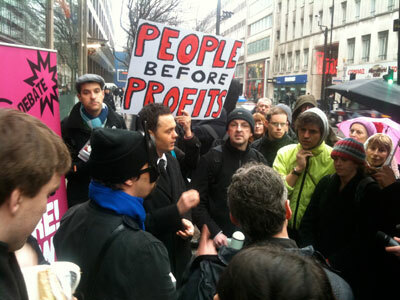 Barclays was today's target after their 2009 record of paying less than 1% corporation tax in 2009. The police as you can imagine were hot on the heels of the activists and what followed was a cat and mouse game of protesters leading police around the city before swooping on various unsuspecting branches of the Bank. 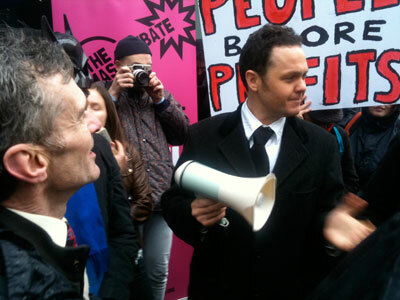 Our target ended up being the Tottenham Court Road branch, and as the dozens of activists poured through the doors the security and police attempted to stem the flow. 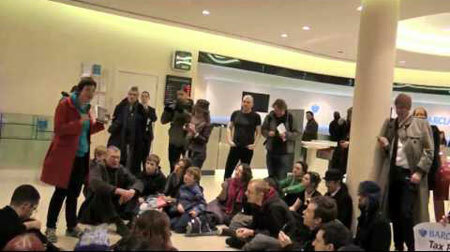 The upper floor of the bank was soon occupied with people sitting on the floor and holding up signs. Brief threats of arrest for trespass were bandied about before the police accepted that we were a peaceful group and it was probably easier to let the protest ride out than start hitting peaceful people (a welcome new approach from them). The only problem however was that the branch was immediately closed (a good thing) but the public and press were held outside whilst the protest took place inside (not so great). 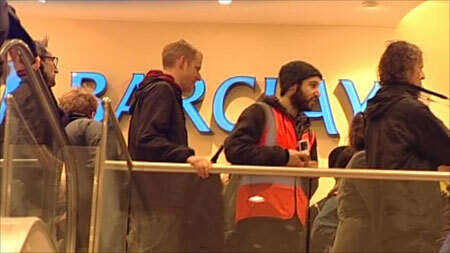 Although the activists had managed to close the bank (and we assume cost Barclays lots of money) there was no way of spreading their word further. 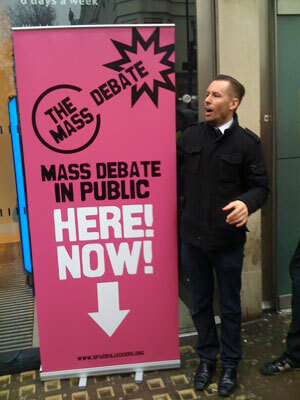 Time for a bit of Mass Debating! 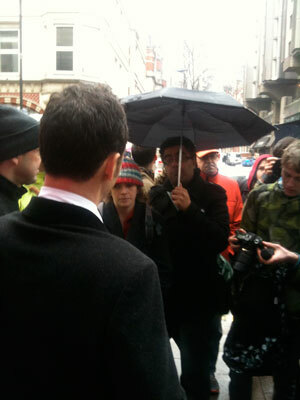 Agents Bristly & Undecided pushed our way back out of the bank and onto the highstreet into the mob of press. Pulling out our big pink erection we proudly showed off our new sign to the people outside. 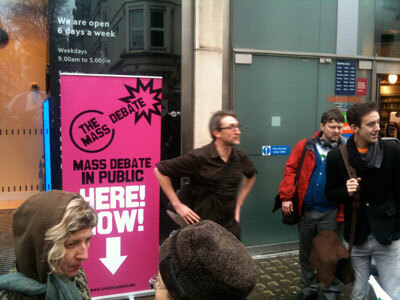 "MASS DEBATE IN PUBLIC - HERE - NOW"
Our plan was to get everyone outside the bank to start discussing what was going on inside and the general finance Vs welfare debate going on in the country. 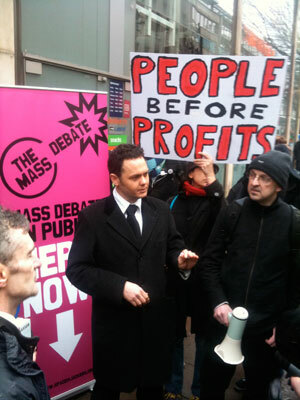 Quoting various statistics about corporate tax avoidance, private healthcare funding of the tory party, tax havens and more we soon discovered, perhaps unfortunately, that everyone outside the bank, and everyone passing by agreed with us. That we'd much rather save our public services than pay the bonuses of a bunch of utter bankers. All very good, and all very positive, however you need two sides for a debate? All of a sudden a rather well dressed man barged his way through the crowd and attempted to get into the now closed bank. "What on earth is going on here?" he asked, as we tried to explain the protest. "But banks avoiding tax is a good thing, it means they earn more money and so my savings prosper"
Oh we were going to have fun here. As you can imagine the baying public soon started laying into the chap. "Morals? Company's must reject all morals to be any good at being profitable"
He was certainly giving his own. It was around the time that he came out with the following line that the Police started hovering closer to make sure he wasn't lynched. "The serfs need the rich like me so that they have something to aspire to, where is the aspiration in a world of equals?" The rain was coming down heavy at this point, but the spirits of the ever grown crowd of passers by were still high. Someone had passed over a Megaphone so that the raging argument between the banker and everyone in the street could be heard clearer. Of course all good things must come to an end, and it wasn't long before there were too many giggles and smirks from the growing number of Hijackers before we were rumbled. Frequent visitors to our website will of course recognise the bolshy banker as our very own Agent Greenman. When he was finally outed in front of the crowd a big laugh and collective sigh of relief was heard from everyone. 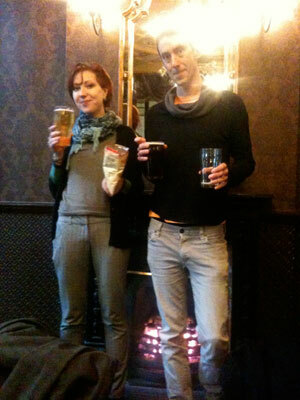 The UkUncut gang evacuated the bank and we all went to go and dry off in our favorite local pub. Watch out for a bunch of people mass debating near you soon..